Where are the smell buttons here? Oh right, there aren’t any, that’s why I haven’t been posting. I’ve been back in the world of words lately because my brother was stupid and ate stuff he shouldn’t, so he spent a couple days at the vet and a couple more here just sleeping, so I’ve been looking out for Juli, so I thought I’d check in. I mostly spend my time napping in my favorite places in the house, getting my family to rub my belly, and wandering around the yard sniffing things. Sometimes I sniff things in the house or on adventures with my family. I have some sort of growth in my pituitary and I’m taking herbs for it, and I feel great. I went to the vet for accupuncture a few weeks ago and he was struck by what a happy dog I am. He’s right. I’m about the happiest dog you’ll see – especially if you are rubbing my belly! Ok, enough words. Leave me pee mail! My people DO still love me! I’ve been really grumpy since a few weeks before Hero came to live with us, because I wasn’t hearing all the positive stuff I usually hear from my family. I thought maybe they didn’t love me anymore or something. Julie was suspicious that maybe I couldn’t hear, so on Saturday she took me to the vet, and it turns out that my ears aren’t working very well anymore. So Julie’s been using hand signals with me 100% of the time since Saturday and it turns out, she really does think I’m a good girl! I’m so much happier! Our new favorite website is the ASL Browser, because Julie likes to talk to me. Posted in veterinary | Comments Off on My people DO still love me! I’d like to introduce my assistant, Hero. I wasn’t particularly enthused about him when Julie and I first picked him up, but Julie’s been telling me I need to prepare for retirement and she was actually right. Anyway, Hero came to live with us in mid-December and was pretty quick to learn to leave me alone when I tell him to (most of the time) and he picked up medic alerting from me in less than a month. I don’t even have to supervise him to make sure he’s doing it right anymore. I still reserve the right to try to kill him when he oversteps his bounds, and he’s still too much of an obnoxious playful puppy for my taste, but he does his job and I’m willing to occasionally leave him a scrap of food to show my approval. I’m pretty much fully retired now because Juli says working was making me too grumpy. It’s true that I’m older than I admit and age is catching up with me. But I don’t see what’s wrong with being grumpy! On the other hand, even with acupuncture, chiropractic, glucosamine, and Rimadyl, I tend to hurt. Juli has given me a new job as the chief relaxer. It’s not a bad gig for an old cocker spaniel, I’m supposed to spend my time being a good example of relaxing for Juli. But I miss being with Juli all the time. Hero hasn’t learned public access skills yet and so Juli is out dogless a lot, which kind of makes me nervous because, well, we all know she’s not really capable of taking care of herself. She hasn’t poisoned herself with her migraine reversal meds yet though, so I guess it’s OK. Hero better quit being such a goofy adolescent dog and get to work on that public access stuff though! I’m going to be in a book! I just found out today that I’m going to be in a children’s book about Dog Scouts – Dog Scouts of America (Dog Heroes) by Shelly Bueche and Chris Puls! There is a picture of Julie and I working on rally obedience at this years Texas Mini-Camp on page 23. Plus lots and lots of my dog and human friends are in the book – including Chris Puls the author and Bear who is pictured on the front cover. The book talks about all the cool stuff we do in Dog Scouts – I can’t wait until it comes out! I finally found out what acupuncture is – and I’m not sure if I like it or not. Jack was supposed to go for acupuncture (and me with him for moral support) back in January, but then he died instead. Today I went for acupuncture. It turns out that acupuncture involves a really through physical exam, including lots of painful joint stretches and finding all the sore spots on my back without fixing them like the chiropractor does. Then, they got out these little things called needles that look more like Julie’s embroidery needles than pine needles – but then they pricked me with them like pine needles do. The one on my head felt a little weird but the other ones were unnoticable once they were in. Then I had to sit there for 15 minutes with the needles in me while the doctor and Julie talked about my arthritis and my treatment plan. Julie pet me though, so it wasn’t bad. And when it was done, the doctor pressed my sore spots and they barely hurt! It’s like magic! I’m tired though. I have to go back next week, but they will only do the needles, not the exam – that sounds better. Oh, it turns out that vet clinic is Ben’s old home! And we got to meet the person who brought him in, ’cause she works there. She was really excited to hear about him and told Julie all about his early days. She’s known him since he was a born (he was one of several neglected rabbits at her neighbors) and still cares about him. That’s really cool! Today Julie took me to the Clark County Fair across the river in Washington. We went and watched some silly labs jumping into a swimming pool after their toys. It was a demonstration of something called Dock Dogs. Then Julie went and signed some papers and got a wristband (I think a wrist band may be like a human collar, but people don’t seem to wear them as much.) Next thing I know we are walking down to the pool ourselves for something called a training seminar. I like training, so I’m thinking this is pretty good. There were a few other dogs down there and when dogs were barking excitedly, Julie let me bark with them! (I love barking!) So I was having a great time until we went up on the deck, I guess they call it a dock, and I found out I was supposed to jump into the pool. Now I love jumping, but I really don’t like water (except to drink! I love drinking water!) Julie and the coaches finally tricked me into jumping in. No fair! I don’t like swimming! I had a hard time getting out because I tried to get out on the side of the exit ramp (it was closer to where I was.) They tried to get me to jump again, but I ran the other way and down the stairs. Julie came to get me and made me walk to the end of the dock again, but then I got to leave! Afterwards, Julie dried me off really well and put my sweater on (I always want to wear my sweater when I’m wet.) Then we went and wandered around the fair. Parts of it were really boring, just like shopping, but there were some really cool scents and we walked around a lot. Plus, several people asked to pet me and Julie let them. I love meeting people! Best of all, the sponsors of the Dock Dogs event, Cricket Wireless were giving out water bowls with their name on them, so I have a new water bowl! I love water bowls, water is so yummy! Just don’t make me swim! Then, today, I had to go to the vet to have a fast growing wart looked at. First they decide that it will be okay if it’s just left alone until I need my teeth cleaned or something. Next thing I know though, Julie is asking Dr Morgan if it’s okay if she tries the newish human treatment of using Duct Tape to remove the wart. Dr Morgan hadn’t heard about it, but after talking to Julie about it, has decided that I can be a guinea pig. (How can I be a dog and a guinea pig at the same time? I don’t get humans.) BTW Don’t try this at home folks, I think Julie got more warning signs to look for than when I had my TPLO. So, if Duct Tape can fix my tunnel and possibly fix a wart without my having to have them burned off, maybe it really can do anything! Now the cat is getting involved! This is just going too far! Tonight, my cat brother Mike was eating my food! As you’ll recall, the other night my pawther was eating out of my dish – at least he ate his own food. 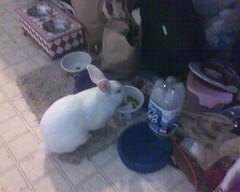 And my bunny brother, Ben, eats my food too – although he usually just eats the crumbs of toothy food I leave around. We had to take Mike to the vet today to get his stitches from his accident removed and he had gained weight from earlier in the week, even though he is on a diet. Julie was wondering why… then we caught him eating out of my bowl! No fair! Posted in dogs | Comments Off on Now the cat is getting involved! My pawrents are really weird about bowls lately. First, last night my pawther was eating out of my bowl! He did let me lick it clean though – boy was he eating yummy food. If he’s going to eat out of my bowl, he should eat whatever I leave (oh, wait, I usually lick my bowl clean, unlike him!) That was really weird though! Then, this afternoon, Julie got out this HUGE plastic bowl. I mean HUGE – it’s like 3ft across and filled it with water. I love to drink water, so I thought that was fabulous! Then a couple hours later, she goes and sits in it! Talk about weird! I don’t understand why anyone would want to get wet anyway, but she said it felt really good. When Julie started talking about hammocks, at first I thought she was talking about “Ham Hocks” – which, in case you didn’t know is another word for pig trotters, so I was excited. Then she brought home a hammock stand and found a box in a spot I didn’t even know existed in the garage with a hammock. And I found out that it’s some sort of weird human furniture. Now all of a sudden, she’s always laying out in the back yard on the hammock. I just don’t get it. Why would anyone think that laying in something that sways around is relaxing? She’s wasting all sorts of good time that she could be lazing somewhere comfortable in the hammock. My pawther thinks I don’t like the hammock because my paws could fall through when I walk on it, but I have no problem walking on it. I just don’t like the way it sways. Plus, the way it wraps around you just isn’t very comfortable. When I do get in the hammock, Julie makes sure to make it a really great experience for me by giving me lots of pets and telling me how good I am. It’s just not worth it. Especially since I’ve figured out that I can lie under Julie and still sniff what is going on with her – then I only need jump up on the edge of the hammock if I need to alert her. Also, when Julie is in the hammock, there is a nice shady grassy spot underneath. I like shady grassy spots! But I still don’t understand why humans think hammocks are good things!